Colosus888 is a comic-book-anthology that publishes several Romanian artists. This book has a certain aspect of avantgarde in regards to layout design. It is a well known fact among publishers that printed material is far less popular to the young generation than is used to be in it`s golden age, mainly due to color animated screens that grab most of the public`s attention. As a means to fight back I think a more interactive printed press is a common answer. More articles, in a given space, more titles, more pictures, shorter texts, brighter colors. Copying the digital environment into a more traditional one. Inspired by contemporary Chinese manhua monthly publications, that contain several comic-book-pages and ads on a normal book page, we took it upon ourselves to add as much as we could while still keeping this mainly, a comic book publication. This was in a real sense a colossal project for the team, since it involved a great deal of post-production. In an eighty pages long mag we managed to fit some 300 shrinked and extensively edited comic-book-pages, some few hundred webpage ads with functional QR codes attached to each, some few hundreds propaganda texts, to encourage young readers to read, draw and publish comics for themselves. 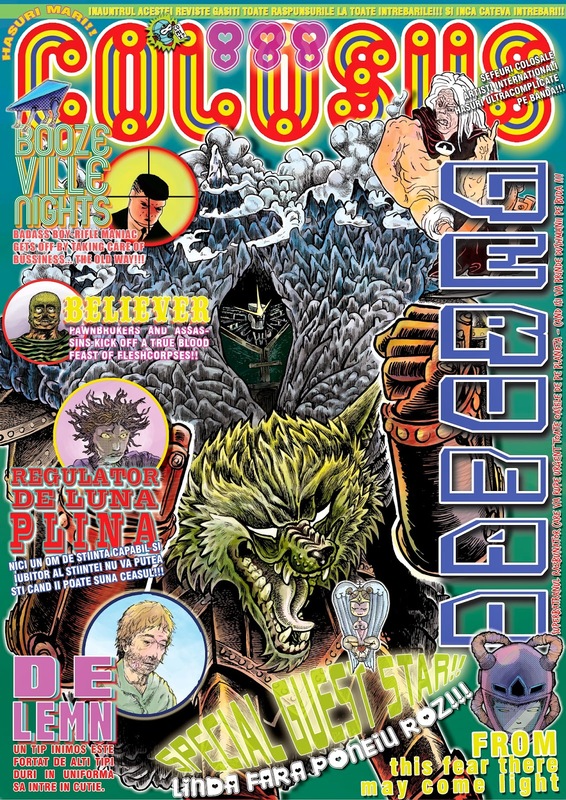 Each comic page has it`s own translation into English, so it makes this a bilingual mag, and some few other elements to make this as interactive as cheap printed paper can be. There are also editorial texts, fan-letters and fan-art. Personally I like this idea and I hope I will get more chances to experiment with it in the future. Colosus 888 was offered as bonus at festivals and book events to those who purchased DIY products from our booth. The book saw the light of viewer`s eye for the first time at SainInk.